In June 2014 two pilot boroughs, Croydon and Lambeth, were awarded Food Flagship status by the Mayor of London for two years to engage schools, local businesses and the wider community around healthy eating. From school food growing and education around healthy diets to learning how to cook nutritious foods, both boroughs have made huge leaps towards making healthy food the norm for everyone. 57 schools in Croydon have increased levels of food growing – a fantastic way to encourage the next generation of healthy eaters! Check out these short films for Croydon and Lambeth to find out more. But you don’t have to be based in Croydon or Lambeth to get support. 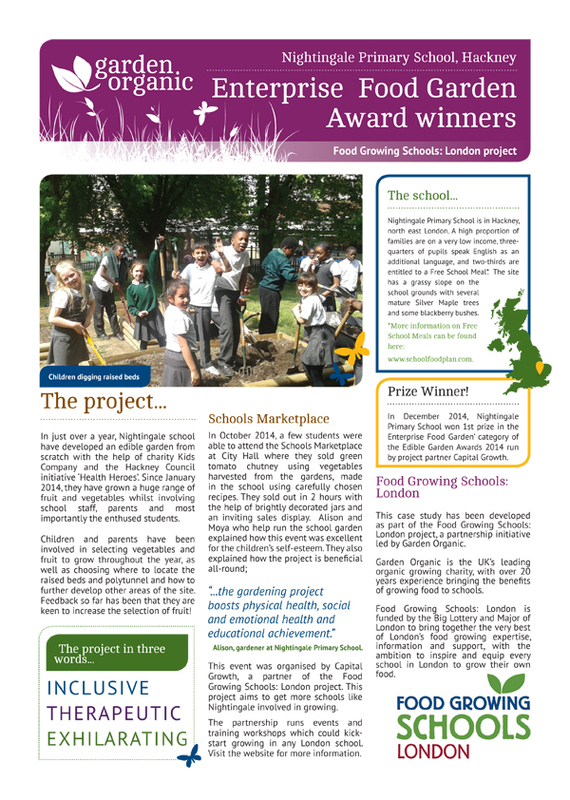 The Food Growing Schools: London Interim Report launched in October 2016 found that 25 of the 33 London boroughs now promote food growing in schools. The Tri-borough (Westminster, Hammersmith and Fulham and Kensington and Chelsea) is a great example of boroughs coming together to support school food growing projects through the Healthy Schools London programme. Queen Elizabeth II Jubilee School, a special school in the City of Wesminster, has been supported by their Healthy Schools Coordinator to plan and develop a garden area accessible to pupils of all abilities. A whole school approach has included staff training and integrating growing across the curriculum. The school is now working towards gaining their Silver Healthy Schools Award. 1. Councils can support schools by promoting the benefits of growing and helping create an environment that makes it easier to get started. Find out where to start and download the free FGSL toolkit to help. 2. The benefits can be felt across the community – from health and education to the local economy, find out more about how encouraging food growing can benefit your borough. We are delighted to report that Chris Collins, best known as the former TV Blue Peter gardener, joined us as a special guest for the first ever Food Growing Schools: London conference last week. The event took place at Argyle School in Camden and was one of two schools conferences this spring that bring teachers and schools from across London together, with the aim of inspiring and supporting them to become food growing schools. Chris Collins is a long-standing ambassador of Garden Organic, and a big supporter of Food Growing Schools: London. His inspirational opening speech took the audience through his impressive career spanning 30 years and including lots more than Blue Peter as he’s worked extensively in Africa, at Kew Gardens and Westminster Abbey too. Chris used the conference as an opportunity to announce that the original target for London’s biggest food growing count, the ‘Growathon’ has been met. It is estimated that over 10,000 London pupils are now involved in growing food at school, with the number climbing by the week. Having already beaten this target, we are now setting the ambitious aim of reaching 50,000 school pupils by the end of the Summer.